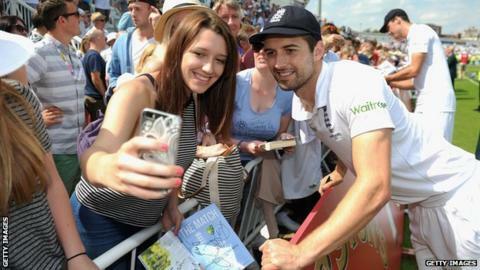 England fast bowler and Ashes winner Mark Wood is currently out injured but took time out from his rehabilitation to answer questions from BBC Sport readers. His answers were interesting, funny, occasionally enlightening and frequently very silly. Here's what he had to say for himself. Jonathan Dixon: Who's the toughest batsman you've ever played against? MW: I thought New Zealand's Kane Williamson was a hell of a player. And Australia's Steve Smith is awkward to bowl at. Harry Ridley: What's your favourite ground in the world? MW: Trent Bridge. It was my favourite ground before I took the wicket that sealed the Ashes there, but even more so after that. Gareth Jones: What would players think if each session lasted 30 overs. This might hurry the fielding side up if they ended up with 20 minutes for lunch or no tea! MW: Definitely not for the lunch break. I'd be bowling backwards if I had no energy. I'm a skinny lad as it is! Good idea, but I don't think it's practical. Duncan Johnson: For young fast bowlers, what one tip or hint would you give them to help them improve and progress? MW: Strengthen in the right areas, practise, practise, practise, and have plenty of fire in your belly. Australia's Steve Smith, according to Mark Wood, is "awkward to bowl at"
Vaust: Why do you take one step backwards at the start of your run-up? MW: It just feels comfortable. I never used to do it when I had a longer run-up. Matt Darwood: What one piece of advice would you give my 10-year-old son who plays for Northumberland U11s as he starts his career? MW: He's obviously already got the talent if he's from Northumberland. Have fun, enjoy it, results don't matter, but take notice of your coaches. They do actually know what they're talking about. Charlie Godden: Other than cricket, what sports do you love playing? Mark Wood: Anything going. Squash, badminton, football - I even had a go at rugby, but I tried to tackle a bloke nicknamed Shrek once, and he flattened me. So that was my last game of rugby. I love boxing and Conor McGregor in the UFC. But who's the worst footballer in the England team? Maxi Kelly: Who's the worst footballer in the team? MW: On the coaching staff, it's bowling coach Ottis 'gammy knee' Gibson. As a player, I'm going for Adam Lyth, because he never passes. Matthew Slight: What's the best dressing room prank you have ever played? MW: In club cricket, one of my mates put a paving block into a team-mate's bag. He didn't realise and carried it round for three months, thinking his bag was very heavy. The best looking lad in Ashington? Ben Harmison, Mark Wood or Steve Harmison? Ben Harmison (Wood's former team-mate, and brother of Steve): Who's the best looking lad in Ashington? MW: Not you with that massive jaw. You're not even the best looking Harmison. Lydia Jane: Would you rather have a pet unicorn or a pet dragon? MW: Dragon. Any day of the week. Especially with weather like this, to blow away the snow and that. Defrost the car, easy peasy, back in the cage. Libby McCarthy (sitting in a school lesson): If you were a superhero, what would your name be and what would be your power? MW: What a mint question that is. My name would be Woody Wonka. And I would call upon my Oompah Loompah army made up of little James Taylors. Freddie Hatchett: Important question here, Woody: Biggie or Tupac? MW: Tupac. Changes is a song that gets played in the dressing room a lot, so Tupac. And here's where it went really silly! Will Barber: What single crisp could you throw the furthest? My pick is a Twiglet. A Quaver would be useless. MW: Right. I'm thinking something like a cheese ball. Or a Monster Munch. But you'd have to throw it like a spiral, not with the hole in the middle. Technique is crucial, it's all about the technique. A Hula Hoop is nice and weighty, but if you throw it wrong, the hole will disrupt you. That's why I'm thinking Monster Munch, because it's got those fingers. If you throw it down the fingers, almost like a tyre, so the middle bit goes straight.